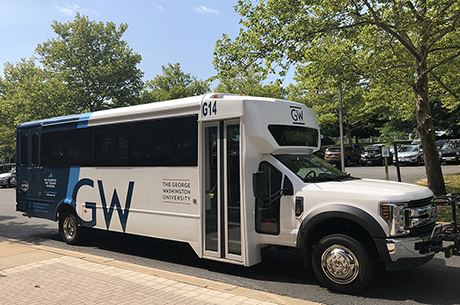 The University provides convenient shuttles between the GW Virginia Science and Technology (VSTC) Campus and the GW Foggy Bottom (FB) Campus in DC, as well as the Wiehle-Reston East metro station. * The shuttle services are free for GWorld card holders (please be prepared to show your ID). * Both of these shuttles run Monday through Friday, except for published holidays. * The public rides the Wiehle Express for $1. Option 1: The VSTC Express runs between the Foggy Bottom and Virginia Science and Technology Campuses. Option 2: The Wiehle Express stops at several points in Loudoun county, the Wiehle-Reston East Metrorail station, and the Virginia Science and Technology Campus. * Wiehle Express Service: Please contact Loudoun County Transit at (571) 258-3464 if any schedule issues/problems arise or the Loudoun County website. * VSTC Express Shuttle: Please contact RMA's dispatch department (24/7) at (301) 231-6555, option 3, if any schedule issues/problems arise.